hello, do I need the 1.0.0.4 san 12 patch or just 1.0.0.1? Thanks. You need San12PK (power up kit) not san12. This patch will update your San12PK 1.0.0.1 to 1.0.0.4. Thank you very much for this patch. In my game, Wang Jing (Yanwei), had wrong name displayed: Wang" Wang, is it just my game? My load and edit button in the main menu is also untranslated. I have a question, what is the military option that is untranslated? The one between "deploy" and "transport". It is always grayed out. Also can you explain how does tribal diplomacy works? Thank you. I will fix Wang Jing's name on the next update. - Load and Edit button are pictures patch, not exe patch. I think it will be coming soon. - Military option you asked was "Repel Bandits" it can use when your city was invaded. - About Tribal diplomacy was about you ask them for attack other or withdrawn their force from your city. 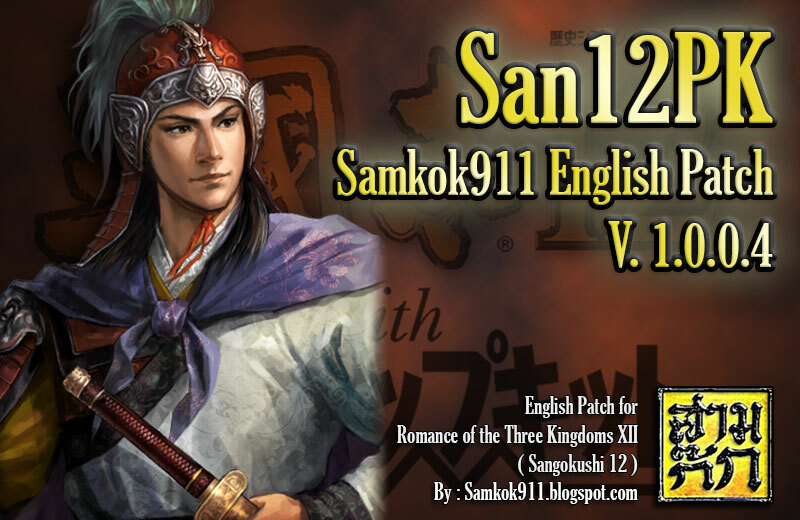 คือลง English Patch V.1.0.0.7 ไว้แล้วเล่นได้ พอลง San12PK V.1.0.0.4 แล้วเล่นไม่ได้ เลยเอา Msg กับ Scenario อันเก่ามาลงทับแล้วเล่นได้เหมือนเดิมอะครับ พอจะแก้ไขได้ไหม? What is the effect of the new city type? I'm referring to the one that is untranslated, like Chang Sha, Jiang Xia, and Ji. Medical City - Heal wounded soldier faster. How does the new duel work? Why isn't my cards replenished every turn while the AI does? What is "prolonged" battle skill new effect? - Card used should be relative with "Heaven - Earth - Human" flashing icon on the left top screen. What is heaven, earth, human? All is saw is the wrong translation carry over from the old version: logic, fact like in san XI debate. Perhaps using the japanese kanji pictures is better for duel. That was the old prolonged effect. Now the skill description says: own +35 CPW. What is CPW? How is combat power different from attack power, defense power, damage, etc? How to get more "rising plan" for getting more plan points every turn? I controlled half of China and has less rising plan than Ma Teng..
- I'm not sure about "rising plan", it may be up to how many of your "Plot" building. Item creation do not work. Can't input latin alphabet names to "appointed" officers. This game accept only Japanese/Chinese. If you wanna create items or named new officer, you must install these languages on your windows system. ผมอยากรู้วิธีปลดล็อก ตัวละคร 7 ตัวนี้ Lu shang /wang jian /Mang tian /Li si /Yue Fei /Bao Shuya /Guan Yiwu มีคนทราบมั้ยคับ? ต้องใช้และสร้างแผน กับสะสมตัวละครธรรมดาให้ครบตามที่เกมกำหนดครับ ถ้าภาคเก่าลองเข้าไปดูในบทความ "22 ผู้กล้าตำนานจีน"
อ๋อ ขอบคุณคับ งั้นคงไม่ได้แล้วล่ะ คงเพราะต้องเล่นแบบหลัง คือ ออนไลน์ หรือลงทะเบียน เพราะ ผมเล่นจนพรุน ก็ยังไม่ได้มาเลย เสียดาย. - You have to buy Japanese original game. Register your game and you will get serials to unlock those scenarios and some hidden officers. - I don't know where to get savedatapk, Sorry. The scenarios you get when you register is scenario 16 and 17? The problem here is that I don't know how to translate these scenarios into English. Scenario 20 and 21 was already translated and available in the original game already, however these scenarios are exactly the same. I tried renaming them to 16 and 17 and they don't show up in the game. Do you know how to unlock these with van's editor? I'm assume there is some kind of flag that marks whether the scenario is hidden or not, in the original version the scenario was hidden as well until I use your sdata.s12. The hidden officers are some ancient generals plus ryuuryoden manga characters with chaospeed and dragonair (pokemon??) skill. Finally figured it out. Apparently the game is not able to read the scenario if the value in van's editor is 20 or 21. Changing it to 16 and 17 do the trick. Thank you very much for your trick. This's very useful for those who don't have serial. Do you know how to use san12pictool or other way to inject new portraits into the game? Actually never mind that, I used a different tool and figured it out. Do you have the link for new officer editor that can input more letters? Van's editor can only take few letters. thanks. When Van's Editor can't. I instead use hexeditor (Madedit) to fix the length of officer name. Hello Samkok, any interest in translating Nobunaga no Yabou: Tendou? Yes, but I don't have that game. Umm, you could buy it, or you could download it somewhere, or I could tell you where to get the game. Is there anyway I could contact you? Perhaps email or something. Its a really good game shame no one bothers to translate it. Gameplay is great! I've seen the trailer and know where to get it. Game-play is better than San12 lot, but difficult to translate, because I don't know Japanese history. Ok I emailed you, did you get it? I can do the translation but I don't know how to inject it into the game or make image patch. Thanks a lot. I'll try first and then decide what can I do with it. Are you still considering it? Thanks. I don't wanna say something like this.but I can't find out how to patch it. What do you mean? Can't you hex edit or use Van's editor? Isn't it similar to san 12? Someone seems able to translate it before, too bad he never bother to finish it. In the scholar's forum, mbahjamrock finished translating them. May be you have to contact him. I think he lied. He tried to sell the games, etc, and he was banned. I have Nobunaga13 with power-up kit. I have tried to play and understand it. Confess that I don't understand it. Although it was a very interesting game. The game is already mostly translated. Wozarion already translates most of the menus, but this person have no idea of how to edit the game exe/inject the translation. Also did you ever play NA: Iron Triangle? It is available in English and the gameplay is very similar to Tendou. A very good game I recommend you try it. When will 1.0.0.5 patch be released? Chaospeed, warhorse, and some other new skill only affect self, not allies, so wrong description. Names can use some fixing, Wang Jing name is bugged (very bad), Hao Zhao is misspelled HanZhao, Huang Zhong surname is displayed Hong instead of Huan, Wang Ji's surname is still Wan, while other Wang have their full surname, Han Dang is still HanDng even though enough space, then some characters have spacing in their name, such as Bao Sanniang, Luo Xian, He Qi, etc, and many more other errors. 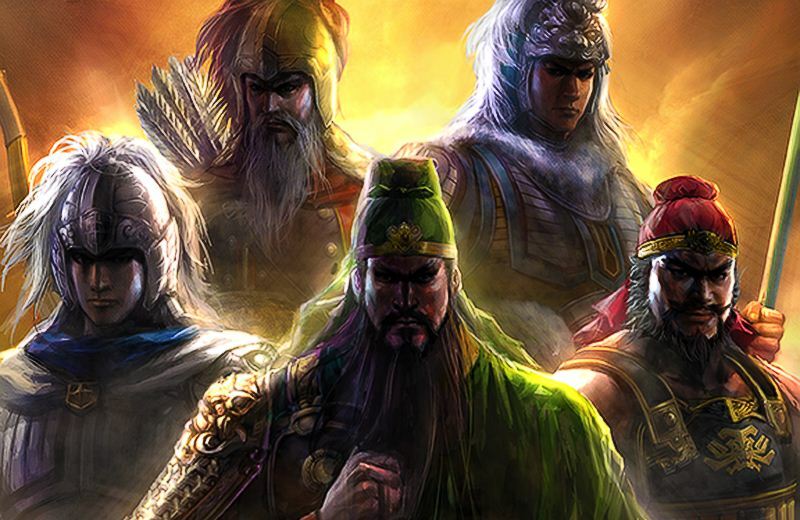 There 2 Zhang Yang, the one wearing yellow turban is supposed to be Zhang Yan. Thank you very much.I'll fix them soon. Motley skill card has a wrong description. It's effect is actually reduce all of targeted force's officers leadership making it an extremely useful skill. พวกทหารแบบใหม่ๆ ต้องทำยังไงถึงจะสร้างได้อ่ะ แล้วเวลาชนเผ่ามาตีเมืองเรา เราจะส่งทัพไปตียังไง มันไม่ขึ้นให้?